This ride, however, I just rode the exit to 2, shuffled straight into position for 6, and set off straight away. I say shuffled into position, as I have the turning circle and skills of a rusty piano, particularly when rocks are involved. Still, a massive improvement on last week, and the more I ride it the more confident I get. Got a bit cross on 6 as there was a large family walking on the second bridge  I give up, I really do. I wonder if more signs are needed, if there are notable areas where walkers accidentally wander onto the trail (Im sure theres one mid-section on one of the sections), or whether people just wilfully ignore the signs and decide to go ahead anyway. Im not particularly maternal, but Im fairly certain if I was in possession of a small child, putting them in the path of a fast moving mountain bike would be fairly low down on my lists of things to do with the kids. Took a short break before and after the fireroad hill up to 8  actually felt more knackered than usual due to racing through 1, 2, 6 and 7. Rode 8, fluffed the last set of drops as I lost too much speed on the preceding turn. Well, when I say fluffed, I rolled them but it was a bit clunky. Didnt ride the end of 8 again as there was a large family sitting at the end who all turned around and started at me as I approached it. Meh. The plus side of not riding the end of 8 (which is normally whenever theres an audience) is that Im normally too embarrassed to stop for a break. Rode straight through 9, 10, 11 and 12 (apart from Evil Root Number 2). Hit section 13 with much gusto, but had to walk up the slope to the start of 14 as I completely lost traction and momentum trying to avoid some animal poop. Had a short break at the start of 14, which is currently very sandy  I think its one of the few sections I prefer if theres been a little rain. Had another very brief break at the start of 15 to allow people who were already there to go on ahead, then went straight into 16. Unlike last week, I rode it pretty well. Not particularly fast or gracefully, but a lot more confidently, and no stupid clipping the handlebars on trees this week. So, this is what Ive got to keep aiming for, along with actually tackling the stuff I keep bottling! On a different note, I only got to ride the Sunday as the Professor was in for his (long overdue!) free service on Saturday. The annoying creaking that Ive been noticing over the past couple of weeks has been eliminated, although it seems to have been replaced by an equally annoying squeaking (brakes, I think). Hopefully thatll settle soon. I still love the Professor though, hes great. FINALLY rode the exit to section 2 – no stopping or hesitation. Both the Professor and I are uninjured. 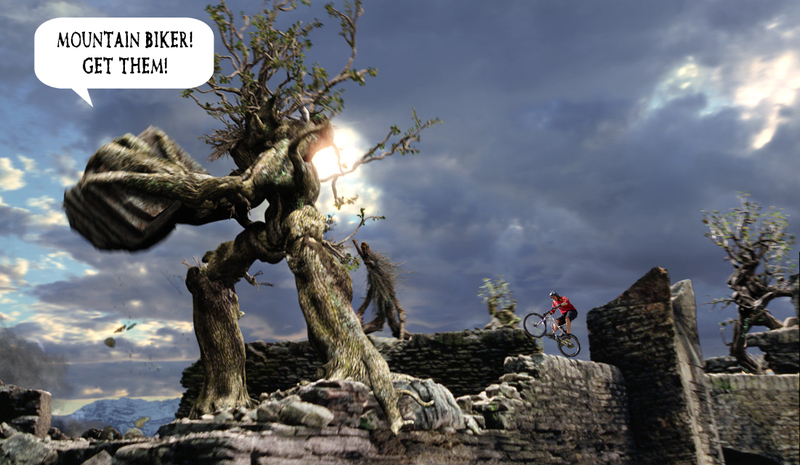 On the downside, I’ve still not conquered Evil Root Number One – the fact the section was open took me by surprise. It doesn’t look as…evil as I remember it though. :/ I also bottled it on the end of section 8, as there was a group of people sitting at the end – although I’m not sure walking the bike down is any less embarrassing than trying and failing. Still frustrating as I’ve never actually failed the end of 8 whenever I’ve ridden it – I just need to keep tackling it on a regular basis instead of chickening out. Rode 13, 14 and 15 fine. 15 no longer has the Stump of Indecision, as trail pixies decided to cut off the left hand route-that’s-not-actually-the-route. Unfortunately I felt really weak and weedy by the time I got to 16 – rode it, but kept on having some silly moments, mostly involving pulling over to let people pass and trees. I’ve just got to keep riding and pushing myself to do stuff that I keep avoiding. And not eat twice my own body weight in food the day before a ride. Or ever again. Post ride food snaffled: Water, even thinking about food made me worse! Good dogs seen: Two husky/malamute type things! Spaniel puppies! Lots of short-legged Jack Russells! On Saturday we went to the Chase Trails Christmas party….2008! Apparently it’s a noble tradition to hold the Christmas party late, and I think this year must have been a new record! It’s Chase Trails way of thanking all of the regular volunteers, and it was great. 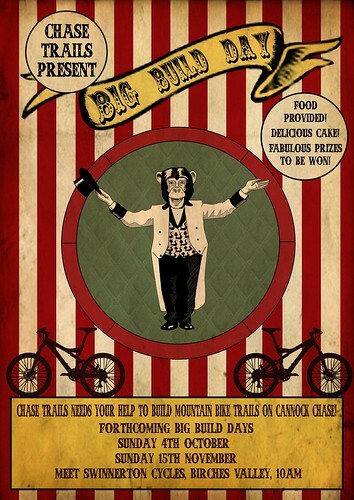 You too should become a member of Chase Trails, and/or help out with the trailbuilding, and you too could be living it up with Christmas curry! Good evening all around, although I ate far too much, and had to listen to Steps far more than anybody should have to (thanks Charlotte…). Rob rolled around on the floor and got beaten up by small children, yet despite possibly being a wee bit drunk, displayed prodigious juggling skills. We hit the Chase yesterday in glorious, warm sunshine. I guess we had to have summer at some point! Due to a combination of weddings, family visits, and illness we hadn’t ridden the Chase in over a month. You may recall the last time I rode there, I had a really, really bad day. It knocked my confidence quite badly, and left me worried I was going to have another bad day. I didn’t get off to a promising start. There were lots of walkers gathered around the start of section 2, so I cautiously weaved through them and entered the trail. I was doing my best to look graceful and effortless, but was sadly distracted by a small child pushing his bike the wrong way – possibly the progeny of aforementioned walkers. Clipped the handlebars on a tree (AGAIN), and came to a stop. Didn’t fall off though, so that was a distinct improvement from last time. I swear, the more I ride section 2, the more I think the trees are out to get me. Bottled the end of section 2, but, after 15 minutes of contemplation and a bit of encouragement from another couple of riders, I rode the start of section 6 with no problems. Well, I fluffed the last couple of rocks that lead onto the bridge, but otherwise pretty smooth, especially when compared to last time. It made me ponder how, by and large, mountain bikers are a pretty nice bunch. Sure, you get the odd elitist arsehats who moan about anybody who’s not as good as them clogging up the trail, but more often than not you also get the people that always say thanks when you let them past, who keep their distance, who offer encouragement and advice. Section 7 was partially open, allowing me to ride the boardwalk. Huzzah! It’s funny – whereas in my mind I make some things a lot worse than they actually are, the boardwalk took me by surprise. I swear it used to be wider – maybe it’s just because I haven’t ridden it much since Glentress and Llandegla, whose red boardwalks are actually pretty wide. Didn’t have any problems though. The post-boardwalk stretch has been nicely repaired by the Chase Trails trail pixies, with the erosion and drainage issues fixed. Hurrah! The section was diverted just before Evil Root Number One, so I managed to evade it’s Evil Rootiness for another week. By the time I’d got to 9, 10, 11 and 12, my confidence (and speed!) had picked up quite a bit, and I felt a bit more back to normal. Raced along, had a bash at Evil Root Number Two, rather predictably bottled it just before the front wheel made contact…carried on to section 13. I rode section 13 at a fairly moderate pace, there were two people in front so I kept my distance. Section 14 was nice and sandy, section 15 now has what I call ‘The Stump of Indecision’ – do you go left around it, or right? Section 16 is still growing on me, I still have to take the start very slowly (trees! ), but the later part is good fun. So, all in all, a great day. I was slow, and had quite long breaks at the start of section 6 and section 8, but I didn’t fall off and rode a lot better than last time. Highlights: Massive improvement on last time, and the weather! Good dogs seen: A truly epic West Highland Terrier puppy. You should have seen his ears. Magnificent! We ventured Ooop North to visit Mr Toast’s parents over the Bank Holiday. Dalby was either closed or restricted for most of the time due to a rally being held there, so we hit the moors with Jaggy in tow. 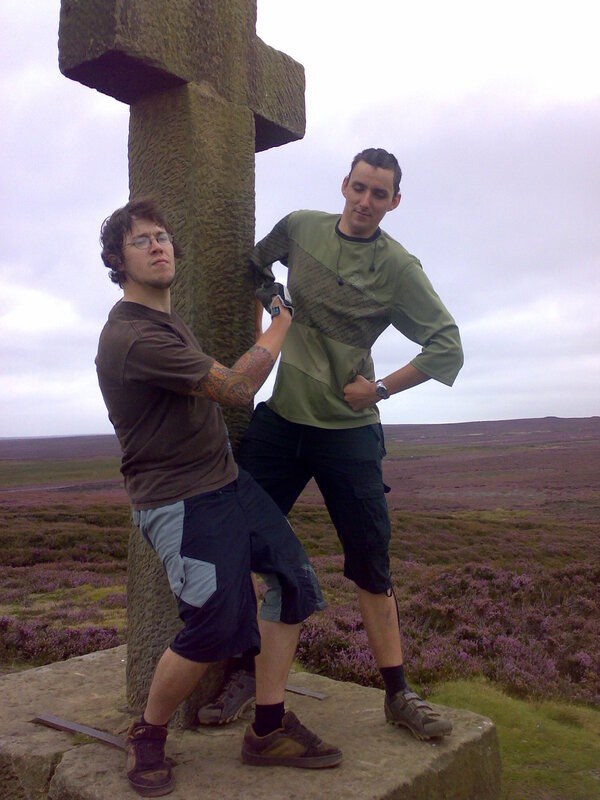 * We’d been meaning to ride over the moors for a while, so it was nice to actually get there. The original cunning plan was to follow a route that Mr Toast found on one of those new-fangled interwebs sites. It promised great scenery and fun singletrack, but even with maps in hand and a print out of the written description, we couldn’t actually find it. 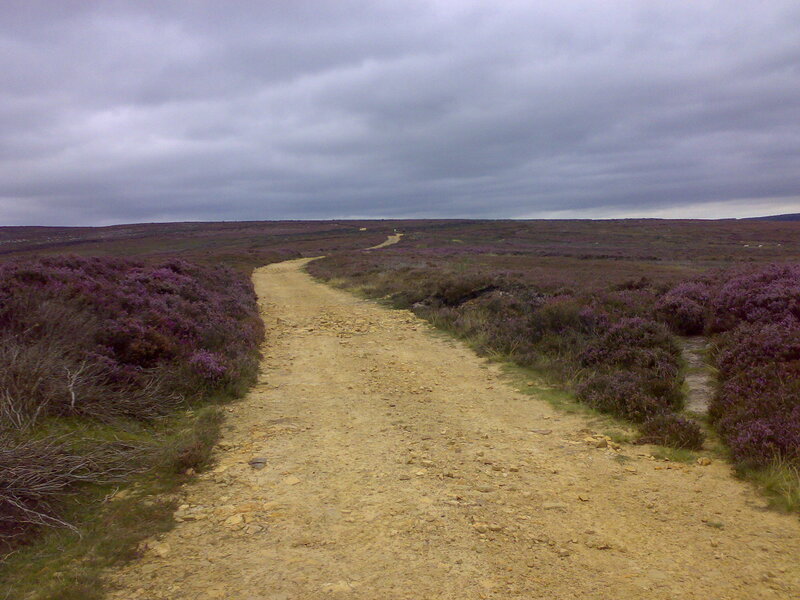 We found a bridleway instead – it was a long climb, but the scenery was still great. And on the plus side, I did see lots of tiny ponies and a goat in a field, and a black grouse. In true Yorkshire fashion, it was quite bleak, but amazing. 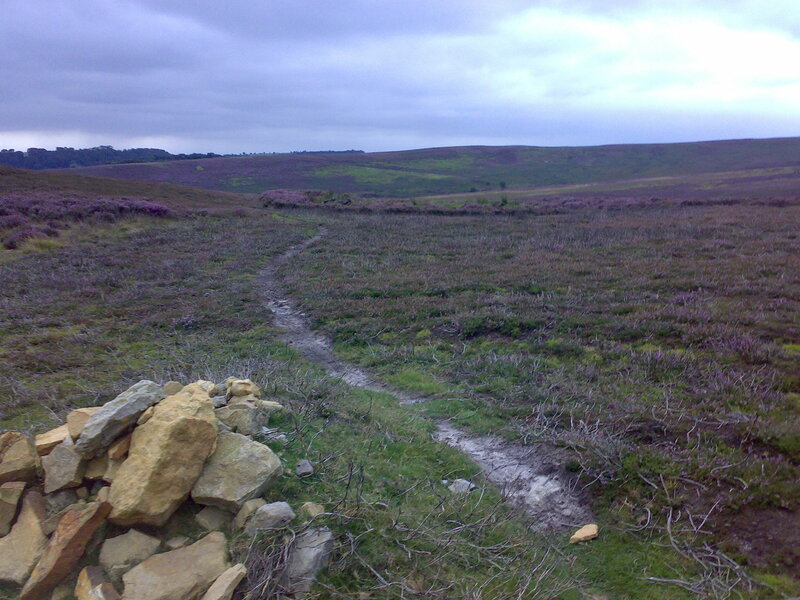 Grey skies, vivid purple and green heathland, random piles of rocks, and a long climb. We did see the odd nice bit of singletrack along the way, but unfortunately by that time it was a bit late for risky exploration. The return trip was miles faster, screaming back down the hill. I hope the next time we go up there we get to explore more, because it looks amazing.